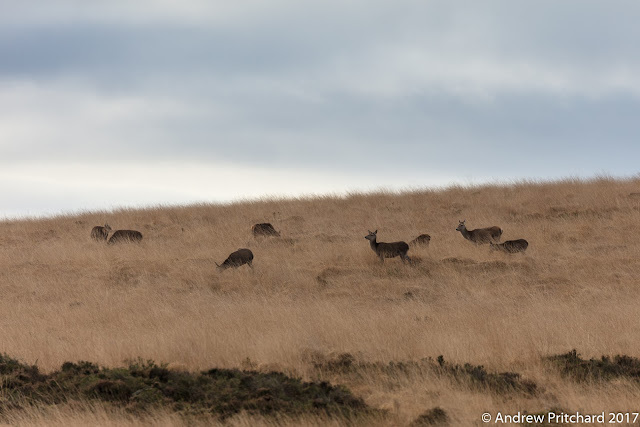 A small group of deer with a young stag graze on yellow grass between stands of heather. The stags are still around marshalling the hinds, although this one looks quite young with only a small set of antlers. Later pictures show that the stags are still roaring, so testosterone levels must still be high. A large group of deer with hinds and roaring stag are being watched from the long grass by a another, patient stag. The roaring stag has a large number of hinds in his vicinity. The lone stag out in the long grass has decent sized antlers, but is not apparently able to maintain control over the hinds nearby. The roaring stag has either ousted him or maintained control for a long time. 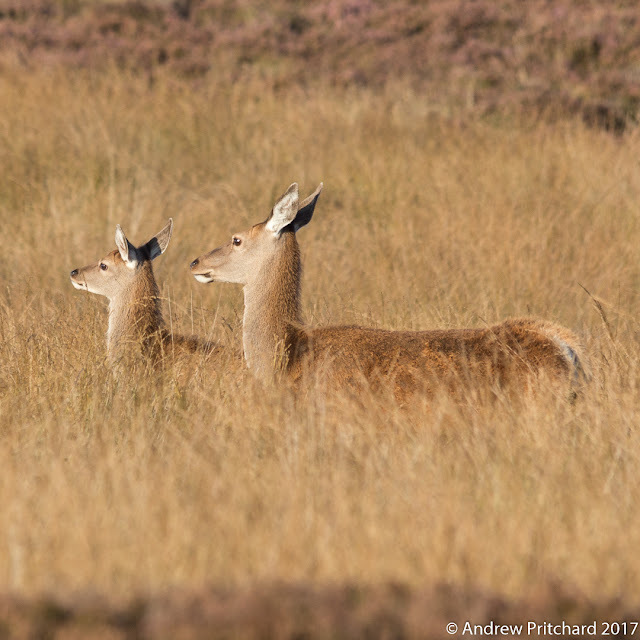 A hind and calf stand shoulder and neck deep in yellow moorland grass. These two appear to be keeping well away from any rut activity elsewhere on the moor. The lower lying areas of deep grass between the more elevated areas of heather nearby offer a useful hiding place. If they were to lie down, the two deer here would be extremely difficult to find. 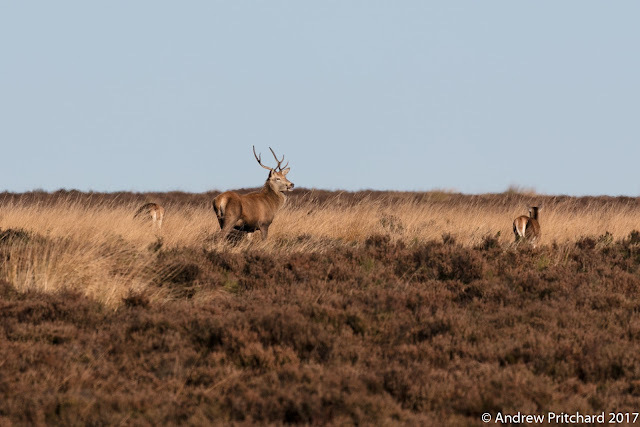 A stag with sixteen antler tines stands in the heather. Having that number of tines makes him a monarch, and it is quite rare to so many points. The classification, based on number of tines per set of antlers is generally as follows: twelve tines for a royal stag, fourteen tines for an imperial stag, and sixteen tines or more for a monarch. Alternatively stags have also been classified in terms of points. So a royal stag would be a six pointer (six per side), an imperial seven, and monarch eight pointer.